This section is dedicated to Inukshuks, which celebrates Canada's aboriginal heritage, and is a symbol of hope and friendship. For centuries, the Inuit people of Canada's Arctic stacked rock in human form to create the inukshuk, a steadfast guidepost that provided direction across the vast horizons of the North. Over time, the inukshuk has become a symbol of hope and friendship, an eternal expression of the hospitality of a nation that warmly welcomes the people of the world with open arms every day. From Nunavut to Newfoundland to the shores of Vancouver's English Bay, the inukshuk offers the welcome of a nation shaped and inspired by our diverse cultures. With its arms reaching for the sky, the inukshuk is rooted in the land that supports our lives and lifts our souls. Elegant 3" Mini Glass Inukshuk that Makes a Great Souvenir! Stunning 6" Glass Inukshuk that Makes a Perfect Gift! Add to your Collection this Beautiful 2.5" BC Jade Inukshuk. The Inukshuk, which Means Resembling Inuit, is used to Guide the Way for Travellers. They were Traditionally made with Massive Rock Slabs. An Inukshuk makes a Wonderful Gift and the Jade will Spread Lots of Good Luck! If you Want Something a Little Larger, then Go for this Beautiful 3" BC Jade Inukshuk. The Inukshuk, which Means Resembling Inuit, is used to Guide the Way for Travellers. They were Traditionally made with Massive Rock Slabs. An Inukshuk makes a Wonderful Gift and the Jade will Spread Lots of Good Luck! 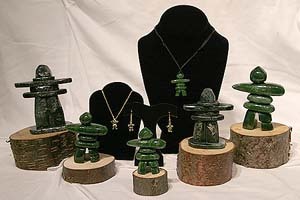 Make a Statement with this Stunning 4" BC Jade Inukshuk. The Inukshuk, which Means Resembling Inuit, is used to Guide the Way for Travellers. They were Traditionally made with Massive Rock Slabs. An Inukshuk makes a Wonderful Gift and the Jade will Spread Lots of Good Luck! Very Authentic 3" Canadian Inukshuk made from Slabs of Green Stone. The Inukshuk, which Means Resembling Inuit, is used to Guide the Way for Travellers. It comes in a Beautiful Cushioned Box with the Definition of 'Inukshuk' Written on the Side of the Box. Very Authentic 4" Canadian Inukshuk made from Slabs of Green Stone. The Inukshuk, which Means Resembling Inuit, is used to Guide the Way for Travellers. It comes in a Beautiful Cushioned Box with the Definition of 'Inukshuk' Written on the Side of the Box. This is a Delicate Canadian Inukshuk Sculpture that is Made from the Finest Cedar Wood. The Inukshuk, which Means Resembling Inuit, is used to Guide the Way for Travellers. They were Traditionally made with Massive Rock Slabs. It is a Very Popular Item that Makes a Terrific Gift! If You Would Like Something a Little Larger, then go for this Delicate Medium Sized Canadian Inukshuk Sculpture that is Made from the Finest Cedar Wood. The Inukshuk, which Means Resembling Inuit, is used to Guide the Way for Travellers. They were Traditionally made with Massive Rock Slabs. A Very Popular Item that makes a Terrific Gift! Take Home this Beautiful Large Canadian Inukshuk Sculpture that is Made from the Finest Cedar Wood. The Inukshuk, which Means Resembling Inuit, is used to Guide the Way for Travellers. They were Traditionally made with Massive Rock Slabs. Makes a Perfect Addition to Anyone's Home!